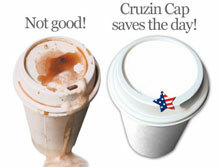 The Cruzin Cap is a simple, cost effective and fun way to cover the sip hole on drink lids. The perfect to go coffee cup, everyone is familiar with a favorite outfit getting spilled on rushing out the door. Cruzin Cap eliminates this problem with it's simple peel and stick design. As you drink, just restick and forget it. It is cost effective, at just a few cents per cap. It's fun, coming in a wide array of explosive colors and seasonal shapes. These disposal coffee cup lids will make spills a thing of the past.